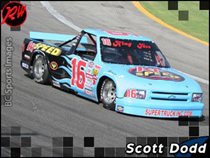 Scott Dodd got the opportunity to race the K1 Speed Super Truck in the King Taco Super Trucks Series. In Scott’s K1 Speed #16 Debut he started in 16th place and finished in 6th place. His efforts also won him the Hard Charger award. That would be the second time in three races the #16 truck has had a driver win the award.